This is a Zydeco dance instructional DVD that brings together the time-proven videos, Learn to Zydeco Dance Tonite and Advanced Zydeco Dance, into one comprehensive package. Dance instructors Ben Pagac and Debbie Shaw regularly explore the southwest Louisiana Zydeco dance halls and bring to the viewer not only the authentic steps, but also the joy and sprit of the dance. The teaching method is relaxed, clear, and easy to follow. Part one breaks down the fundamental step, demonstrates the subtle Zydeco weight shifts, explains partnering, and provides more than twelve moves and step variations. Part two progresses with more than 20 challenging moves and variations. The entire DVD clocks in at 90 minutes, so there is a lot of valuable material covered. Additionally, the DVD is professionally authored with menu buttons that allow you to selectively jump to desired sections without having to scroll. 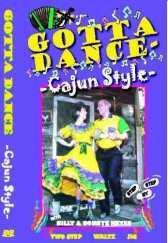 Recommend this Cajun and Zydeco Videos and DVDs page to a friend.